The sustainable use of resources, is a subject close to our hearts, here at the Gardens. With an eye for what can be reused and adapted, John has been collecting materials over the last few months. 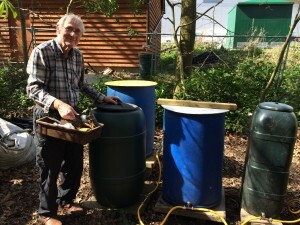 Our Friends and supporters have donated water butts, dustbins (now redundant following introduction of wheelie bins) and plastic storage containers, concrete slabs, bricks, a series of hosepipes, clips and taps which have been interconnected by John. The water is then capable of being siphoned around the Gardens. For the syphoning system to be most effective, the water source needed to be higher than the collecting chambers. John had spotted a wooden building on a higher level nearby. 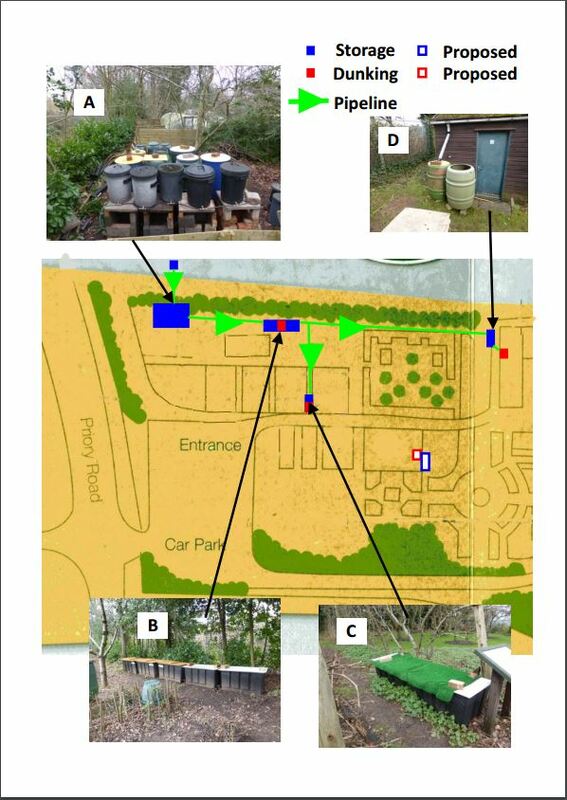 So with the support of our neighbours at Edgbaston Priory Club, John diverted a drainpipe so that the rainwater run-off is channelled into the collection chambers at Martineau Gardens. 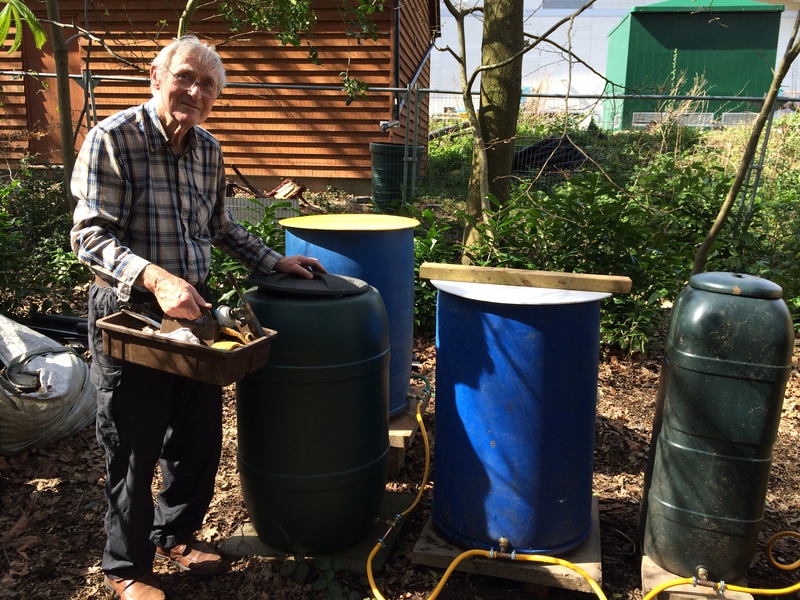 Located close to the vegetable beds, this new water storage system makes it much easier for the Garden Volunteer team to look after the crops growing. 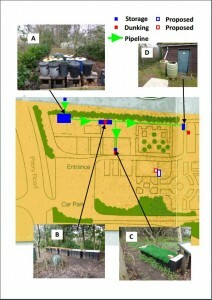 The pipeline now stretches from this wooden building (located at the Priory Road end) all the way down to the Hot House (see the plan and pictures at the end of this page). If you’d like to see the progress next time you’re at the Gardens, head for the polytunnel and follow the signs. Children will enjoy following the network through the Gardens, and at the same time find out how the process of syphoning works. Click on the links, if you’d like to know more about our organic practice or how we recycle at Martineau Gardens. The greenline shows how the rainwater system carries water from one end of the Garden, past the vegetable plots and onto the Hot House. John is extending the system to reach the (work in progress) Pavilion Garden, which will make it easier and ‘greener’ for watering the plants in this area. We are also seeking large dunk tanks (water header tanks) – can you help? Please call Gill on 0121 440 7430.